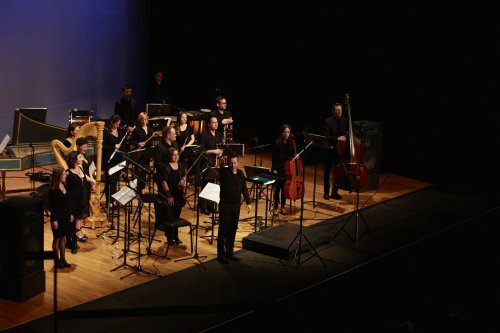 The Composer Portraits Series at Miller Theatre at Columbia University concluded its 2014-2015 season with works by Anna Clyne, presenting four of her compositions. These were performed by individual musicians as well as the whole chamber orchestra of Ensemble Signal as conducted by Brad Lubman; there was also an on-stage interview with the composer. 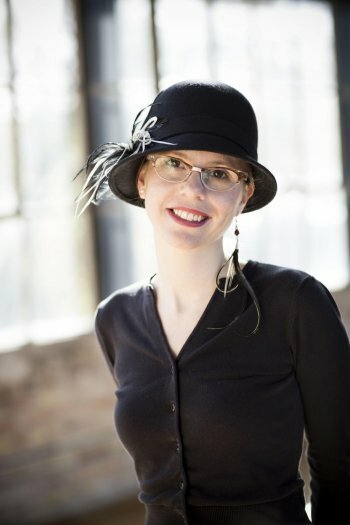 Anna Clyne is a young composer – she was born in 1980 in London – who now lives here in the United States. In spite of her youth, the core of her music’s identity, an unabashed forthrightness, seems already well established. Clyne’s music is a combination of electronic and recorded material on the one hand and live performance on the other. In both process and product, Clyne incorporates and is inspired by other creative media; her works can “stand alone” or in conjunction with their original collaborators. Two works originally conceived in collaboration were performed on April 23 “on their own.” Fits + Starts for amplified cello and tape (2003) was performed without dancers; Rapture for clarinet and tape (2005) was presented without the visual components that accompanied its original performances. In both these pieces – in which Lauren Radnofsky (cello) and Adrian Sandi (clarinet) played exceptionally difficult music with absolute technical control and considerable virtuosity – audacious, tough, loud declarations alternate with unexpectedly tender, lyrical sequences. Because the solo instruments are playing “with” the recorded material of sounds made by both musical instruments and ambient real-world sounds and because of the strong visual allusions of Clyne’s compositions, the effect is something like a movie: the recorded music seems something like a soundtrack, and the live instruments are like characters carrying plot, or human psyches recast as music. This “movie” effect of soundtrack-and-narrative or context and character was multiplied in the quartet 1987, written in 2008, in which Radnofsky and Sandi were joined by Kelli Kathman (bass flute) and Olivia De Prato (violin): here the four instrumentalists’ fast moving engagement with each other as well as with the recorded music and musical sounds was even more complex than in the single-live-instrument pieces. The intensely layered – and sometimes intensely loud – music of all three of these instrumental pieces was rarely beautiful in any traditionally sentimental or popular sense, bordering sometimes on the cacophonous, but was never uncontrolled. In its present state as performed on April 23, As Sudden Shut was sung by three vocalists – Melissa Hughes, Jamie Jordan and Kirsten Sollek – together with the full Ensemble Signal chamber group, including three flutes. Though the final work will include five Dickinson poems, the three in this performance, “As Sudden Shut,” “The Lost Thought,” and “Postponeless Creature,” form a cohesive thematic and musical whole. Thoughts come and depart, neither bidden nor dismissed, assembling and announcing themselves as eerily and inevitably as death. Dickinson’s references and images, the plain things of nineteenth century New England domesticity – door latches, sewn seams, balls of yarn, mourning crepe – are well evoked by the Celtic folk-song echoes of Clyne’s writing for women’s voices in this piece. These echoes lend both haunted poignancy and ominous lyricism to the modern music of edgy examination, of wondering about the relationship between past and present, history and future, recorded sound and live music. When As Sudden Shut is completed, it will be interesting to see how these three first movements fit in with the finished work. At the beginning of the second half of the concert, Clyne was interviewed by Lubman, founding director and current music director of Ensemble Signal, and a member of the Eastman School of Music faculty. The interview, during which the audience learned a good deal more about Lubman’s ability to see all possible ways of interpreting apparently simple questions than about Clyne’s possible answers, did produce some useful information. Clyne’s first exposure to music as she grew up in England was not to classical music but to popular music: she listened to pop and jazz, to Pink Floyd and Bob Dylan, and then various sorts of folk music. She began her own composing with acoustic music and then branched out into electronic music when she was in college; she began combining the two when she came to Manhattan School to study composition in 2002. Throughout the course of the evening, these various influences were all audible. Clyne is a dynamic, full-open-throttle kind of composer: her music is not for the faint-hearted. It alternates explosions and silences, jabs and occasional caresses, relentlessness and fluidity. Her music is both disciplined and unnerving. Her youth and her happy insistence on collaboration with artists in many fields will probably take her composing in all sorts of unforeseeable directions in the coming decades. But her core unabashed, focused forthrightness is likely to change only in increased maturity. The April 23 performance of her works marked both Clyne’s accomplishments to date and the promise of her future. It is a remarkable musical that takes on serious questions of our time and works them out in the course of its 19 songs. It is a grown up musical for adults and takes its big questions seriously.